The Bill Bliss memorial looks out across the San Francisco Bay from a viewpoint in the Palo Alto Baylands. 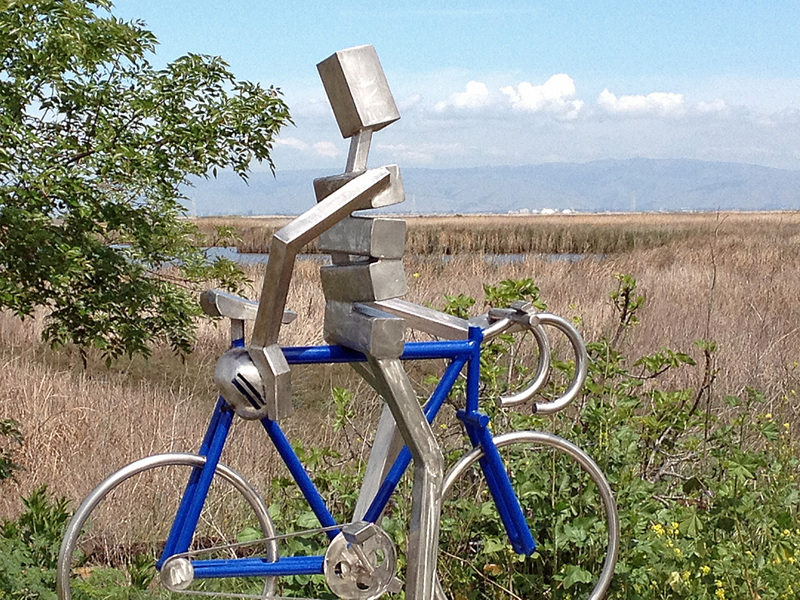 Bliss in the Moment by Palo Alto artist James Moore, was installed along the Bay Trail in January 2011. The odometer on the bike reads 20,136, the number of miles Bill Bliss rode on his round the world “Odyssey” during the year 2000. Tragically, a negligent driver ran into Bill in 2005 as he was traveling in Colorado with a touring group of bicyclists. Bill died in the collision. Bill Bliss and Girls, 1976, Adventure Cycling, Missoula Mt. 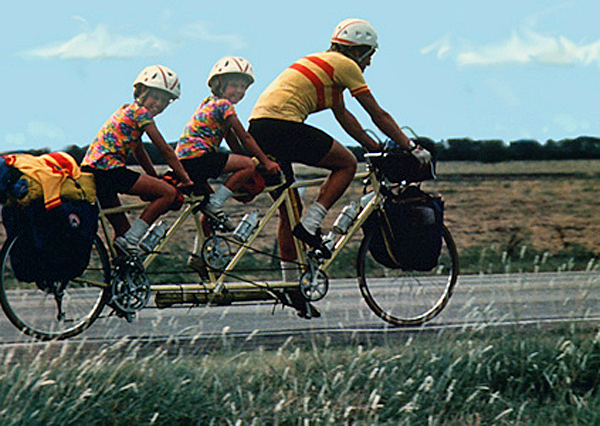 The unique “triple tandem” bicycle ridden by Bill Bliss and his two young daughters (then seven and eight) for more than 4,200 miles across America with the 1976 Bike Centennial now rests above the entryway of Adventure Cycling’s headquarters in Missoula, Montana. will encircle San Francisco and San Pablo Bays with a continuous 500-mile network of bicycling and hiking trails. It will connect the shoreline of all nine Bay Area counties, link 47 cities, and cross the major toll bridges in the region. To date, approximately 310 miles of the alignment—over 60 percent of the Bay Trail’s ultimate length—have been completed. “Bliss” is a great piece of public art that sits in a perfect spot; well, it works for me. Stop off sometime when you go through Palo Alto: exit at Embarcadero Rd. towards the Palo Alto Baylands. Turn right at Ming’s and follow East Bayshore Road for about a mile to the sculpture and vista point. Enjoy a walk while you are there.